Water is the most abundant molecule in the body. Everything that happens on a cellular and extracellular level requires water. It is important to stay well hydrated especially after treatments. Our connective tissues must stay lubricated in order for normal function to occur and water is a huge factor. Hyaluron is a substance that binds water and helps to keep the soft tissues and joints lubricated. Many of the supplements we take to preserve joints function by binding or holding water. If these tissues are dehydrated, they will be at higher risk for degeneration. Most of the treatments we provide work mainly by breaking apart hyaluronic acid densifications, or fascial tension. When broken apart, the molecules can better bind water, and therefore better lubricate leading to better movement. It is important to have a steady supply in order to get the most benefit from the treatment. It is critical that you drink pure filtered water, as there are unfortunately many pollutants in our water supply. We highly suggest that you also filter the fluoride from your water. Click Here to learn more about the effects of fluoride. Start by drinking 12-16 ounces of water first thing in the morning before eating or drinking anything else. This will help get your body to start getting ready for the day. You may add the juice of half a lemon and a pinch of sea salt to give flavor and boost electrolytes. Try to sip water throughout the day instead of drinking it all at once. You should drink about 1/2 your body weight in ounces per day. For example, if you weigh 100 pounds, drink 50 ounces of water per day. This includes all liquids that you drink and eat (fruits and veggies are mostly water). 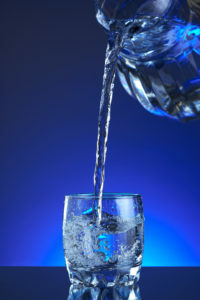 Do not drink more than 4-6 ounces of water with meals. This can dilute your stomach acid and digestive enzymes and prevent your food from being properly digested. During your walking or exercise, drink a minimum of 16 ounces per hour, and drink another 8 ounces during the 15 minutes after exercise. You lose a lot more water than you think. It is usually a good idea to stop drinking water by 8:00 PM or 2 hours before your bedtime. Urine is a good indicator of hydration. It should be as clear as possible. Stainless steel or glass containers are best to drink from. Plastic contains toxins that are harmful to our bodies and the environment. Here is a link to the drinking water and shower filter we recommend. It will be the best water you ever tasted!